These are the people who spent their time making the official elfpack badges. 2005-06-20 [Sunrose]: You buy them in a store? 2005-06-20 [Dwemer]: Hehe! So true. 2005-06-20 [Sunrose]: See Badge makers info for which badge everyone did (thanks to [Amalaswinta] ;). 2005-06-30 [Kosumo]: Neat-o!I'm interested in making badges, so I'll guess I'll have to work on some! 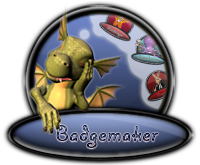 2007-07-30 [Bookwyrm]: Added myself to the badgers. ^^' The two official badges I made are on the Badges page on the bottom, they are being used officially. Also added this to the info page. 2007-11-14 [CHACHA]: i wounder if anyone could help me make a badge for my wiki that i have made. 2011-12-04 [sammie h! ]: is there anyone who is willing to do me some badges. I am asking if you can make a staff badge and first second and third place badges on Food Decor Competition construction wiki. Contest moderators don't get custom staff badges (They get Volunteer badges). And there's already a badge for official contest winning, only very few contests get special unique badges. 2011-12-05 [sammie h! ]: Thats what I meant, a volunteer badge for the wiki. 2011-12-06 [Stephen]: There already is a volunteer badge. 2011-12-06 [Stephen]: There's never been any special badge made for any "crew" of any one-time contest. We had the Contest Crew, but that was removed. Crew members of contests that are ongoing get a badge for their work on maintaining the contest over a long period. Someone who makes a new official contest gets a Contractors badge, but past that, there's nothing other than the normal Council/Volunteer badges. 2012-03-30 [Stephen]: Wow, go Kitty.